Blagòevgrad (Bulgarian: Благо̀евград) is а city in southwestern Bulgaria, the administrative centre of Blagoevgrad Municipality and of Blagoevgrad Province, with a population of 70,881 inhabitants (as of 2011). It lies on the banks of the Blagoevgradska Bistritsa River. The city is the economic and cultural centre of southwestern Bulgaria. It is located in the valley of the Struma River at the foot of the Rila Mountains, 101 kilometres (63 miles) south of Sofia, close to the border with the Republic of Macedonia. Blagoevgrad features a pedestrian downtown with preserved 19th-century architecture and numerous restaurants, cafés, coffee shops, and boutiques. 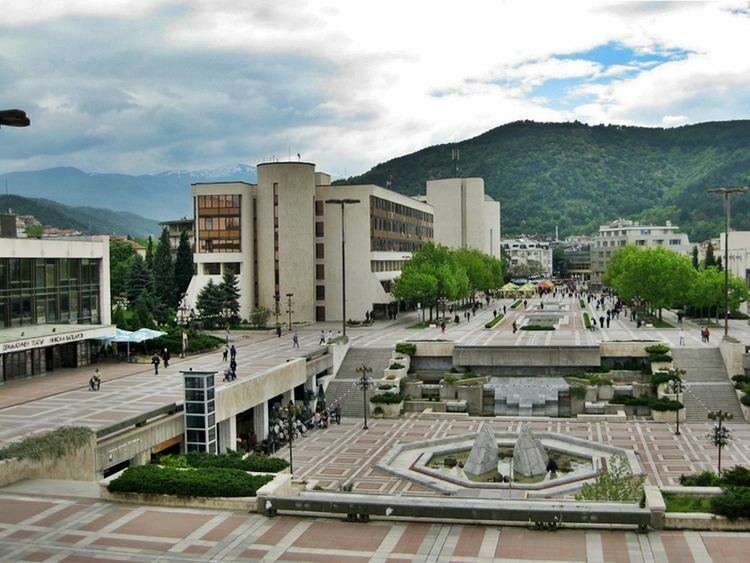 Blagoevgrad is home to two universities, the South-West University "Neofit Rilski" and the American University in Bulgaria. The city hosts also the "Sts. Cyril and Methodius National Humanitarian High School", the former Bulgarian Men's High School of Thessaloniki moved from Thessaloniki to Blagoevgrad (then Gorna Dzhumaya) in 1913. Attractions in the surrounding area include the resort Bodrost. The name Blagoevgrad is a recent construct from Blagoev + the Slavic suffix -grad, "Blagoev's city". Blagoev is from the Bulgarian personal name Blagoy, from blag, "sweet, figuratively- gentle and kind". Named after Bulgarian Workers' Social Democratic Party founder Dimitar Blagoev, a refugee from Greek Macedonia. The climate is transitional continental with a strong Mediterranean influence, due to air masses that enter from the south valley of the Struma river. The city is protected from cold northerly winds due to the natural barrier of the high hills of Rila massif and the village of Belo pole. Mountain breeze descends from Rila along the river Bistritsa bringing cool air during hot summer days. Wind is moderate - 1.6 metres per second. Thanks to the many mountain forests around the town and the lack of industrial pollution, the air is clean in Blagoevgrad. Winter is mild, brief and marked by little to no snowfall. The average temperature in January is 0.6 °C (33 °F). Summers are long and dry, with a small amount of rainfall. The average July and August temperature is 24 °C (75 °F) and the maximum temperature measured in Blagoevgrad is 44.6 °C (112 °F). The average annual temperature is around 13 °C (55 °F). An ancient Thracian settlement called Scaptopara (market town in Thracian, Σκαπτοπάρα in Greek) emerged on the site around 300 BC and was later conquered by the Roman Empire. The settlement was known for the hot springs in the vicinity. Although the history of the settlement in the Middle Ages is unknown, during the Ottoman rule of the Balkans it became a Muslim-majority town called Cuma-ı Bala, meaning Upper Juma in Persian and Ottoman Turkish. A Bulgarian quarter called Varosha was formed during the Bulgarian National Revival, with many of its typical houses and the Church of the Presentation of the Mother of God from 1844 being preserved to this day. A chitalishte was founded in 1866 and the Balkan Wars of 1912-1913 saw the liberation of the area from Ottoman rule and its integration in the Bulgarian state. Before the Balkan Wars, Cuma-ı Bala was bounded as kaza to Serez sandjak in Selanik vilayet. In 1900, according to Vasil Kanchov the population of the town numbered 6440 people, of whom 1250 were Bulgarians, 4500 Turks, 250 Vlachs, 200 Roma, 180 Jews and 60 Greeks. During that time most of the Turks lived in the city and the Bulgarians lived in the surrounding villages. Many refugees from Greek and Vardar Macedonia arrived in the town in the subsequent decades as the town, then known as Gorna Dzhumaya (a partial translation of the Ottoman name), continued to grow in size and importance. The name Gorna Dzhumaya ( Горна Джумая; "Upper Dzhumaya") distinguishes the town from Dolna Dzhumaya (Долна Джумая; "Lower Dzhumaya", "Cuma-i Zir" in Turkish) to the south, today called Irakleia and located in Serres regional unit, Macedonia, Greece. The town was renamed Blagoevgrad in 1950. Because of the large number of students (partly due to the South-West University and the American University in the city), its cross-road location, nature and number of social factors, the city has relatively well developed economy. There are many clothing stores, cafés, and restaurants. The district has the sixth largest economy in Bulgaria, for its share of the GDP, after the more industrial districts of Sofia City, Varna, Sofia District, Plovdiv, and Burgas. The number of people registered as unemployment is slightly below 10%, less than the average for the country. Food and tobacco processing industries - Animal products, fruit, vegetables, tobacco, and liquor production. High export potential. Textile industry - Foreign investors have helped the development of many firms that produce ready-made clothing. Timber and furniture industries - The easy access to local resources makes gives that branch perspectives for development. There are open foreign markets for furniture. Increasing interest of foreign investors. Iron processing and machinery industry - Firms specialize mainly in production of metal constructions and details. Radio-electronic equipment and other electronic communication components are being produced. Construction materials industry - The terrain characteristics are suitable for the extraction of certain minerals, used in construction. Marble is extracted at numerous locations in Sandanski municipality, Koprivlen, Petrich, Strumyani. Other - Tourism, pharmaceuticals, plastics, paper, shoes. The town is very attractive to investors, both foreign and native. It is no coincidence that Blagoevgrad is the third largest city by number of building permits. Blagoevgrad is growing and the small bordering villages of Elenovo and Strumsko are now considered part of it. Recently there was a major overhaul of the city park and a new bridge was built. Currently the city has 7 hypermarkets: Metro, Technopolis, Technomarket Europe, Mr. Bricolage, Billa, Kaufland, and Lidl. Generally, sports are well developed, but the town's traditionally strong sports, handball and basketball, have been in financial crisis and without representation in the national leagues in years past (only supporting children and youth ensembles). The crisis in basketball and handball provides others with the opportunity to pick up pace. Taekwon-Do, in the form of "Falcon" club has given Blagoevgrad and Bulgaria multiple European and World Championship medals, including a European Championship in 2004 (Todor Kozladerov). Baseball is a little-known sport in Bulgaria but it thrives in Blagoevgrad. The local team's name is the "Buffaloes" and its manager is Yassen Nedelchev, who also serves as the Bulgarian Baseball Federation's president. In 2010, the "Blagoevgrad Buffaloes" won their 17th National title (in 18 attempts). The town has two multi-purpose sports halls, the second was opened in 2007, it has a capacity of over 1000 seats and meets all requirements of the International Federation of handball, basketball and volleyball, a game area may be used for competitions Rhythmic gymnastics and martial arts. The town has three well-maintained complexes for tennis, a football stadium, six small playgrounds for football, an Olympic size swimming pool, a go-cart track and one of the best games of baseball in the Balkans. In 2008 construction began on a new sports complex at the South-West University "Neofit Rilski" for the needs of its students. Despite the well-developed infrastructure for the sports facilities, Blagoevgrad citizens often use the public space of Bachinovo park in order to jog, commit to sports activities, such as football, rugby, and frisbee and develop the community sports environment, typical for post-Soviet culture of Bulgaria. The new facility of AUBG, the ABF center serves as occasional facilitator of the national volleyball training and competitions. Blagoevgrad has given Bulgaria and world football talents such as Dimitar Berbatov and regularly feeds the wealthy football clubs. Local team investment is lacking. At present in Blagoevgrad there are four actve male clubs, three of which bear the name "Pirin". The "A" group is PFC Pirin Blagoevgrad. Pirin Authentic, then discard it in "B" group in 2005 due to obligations to Social Security, was usurped by a group of businessmen D15, and then failed to return to professional football during the 2008/09 season and will play in the Western B Group . Pirin 2001 - the team owned by former international Ivaylo Andonov, competed in the Southwestern 'B' group. In the championship of the Blagoevgrad District League (zone "Bistritsa") features one Blagoevgrad football team - FC Athletic. Francofolies Blagoevgrad is the host of the most important francophone music festival "Francofolies", which takes place annually in only few other locations: La Rochelle, France; Montreal, Canada, Spa, Belgium. The festival has attracted some big names, including French pop singers Patrick Bruel, Patricia Kaas, Zaz, rapper Fefe, and the groups Nouvelle Vague and Gypsy Kings. Bansko International Jazz Festival Blagoevgrad is also one hour away from the prestigious Bansko Jazz Festival. which takes place every year in August. Former participants of Bansko Jazz Fest include Jamie Davis, Joss Stone, and Vasil Petrov. Bulgarian National Radio Awards Blagoevgrad was also chosen by the BNR to host its annual awards show, which brought to the city Bulgaria's greatest musical talents. The recently inaugurated Art Salon of Radio Blagoevgrad is the host of monthly art shows, book opening presentations and exhibits. Historic House Museum "Georgi Izmirliev"
Blagoevgrad Peninsula in Graham Land, Antarctica is named after the city, and Skaptopara Cove in Greenwich Island in the South Shetland Islands, Antarctica is named after its ancient ancestor Skaptopara.